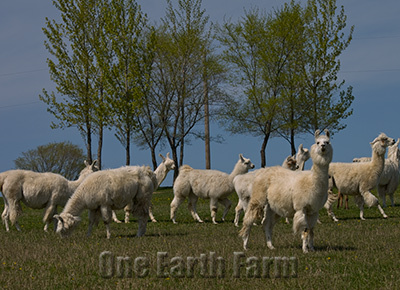 The llama herd at One Earth Farm is unique among North American herds. It was born of a passion to create true and lasting value in this long overlooked species of livestock. Since Lama glama’s arrival as a zoo attraction back in the late 1800’s, it has more or less existed as a mongrel horde here in the US – neither purebred nor livestock, neither reliable nor useful. 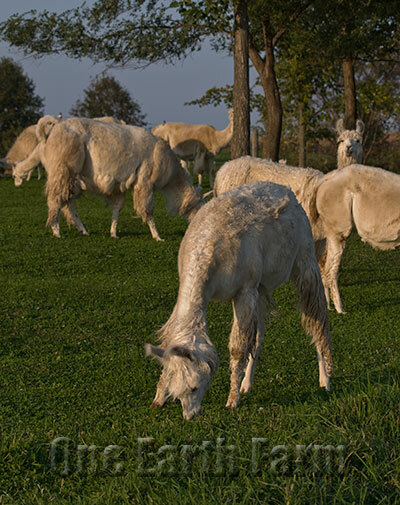 Our mission at One Earth Farm is to help put right this situation and reinstate the llama as the livestock of choice for the Earth conscious, discriminating farmer. Our first peek into the llama industry left us aghast. We saw a species that is among the most environmentally friendly and potentially most utilitarian of domestic ruminants being kept and bred for all intents and purposes as pets. Its value as an adaptable and useful livestock species had been replaced by its value as a tax right off and/or an ever malleable – though undeniably fashionable - show animal. Because of this species’ ancient and intimate association with man as a beast of burden, it is highly tractable and delightfully personable. And this coupled with their natural grace and beauty has certainly made them perfectly suited as pets, show animals, landscape enhancement, and tax shelters. But so too has it made them perfectly suited to the Earth-centered agrarian lifestyles of the past. 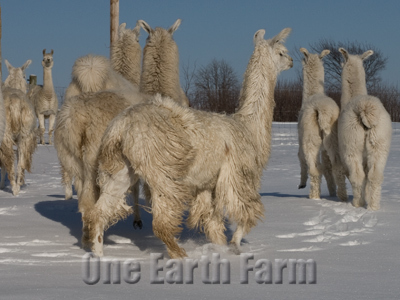 From the onset we here at One Earth Farm were very particular about which animals we would use in our program. As our selection goals are very specific and as llamas in North America are not in any way maintained as purebreds, we chose to ignore the infamous ‘lines’ and the dirge of outcrossed ‘champions’ being offered. Indeed, shopping for llamas has proven to be a bit like locating a Cornish Rex kitten amongst a gaggle of barn cats. Plus, time and time again a peek into a llama’s pedigree revealed every fiber type, size, color, and style of llama being interbred in a seemingly haphazard fashion. It also revealed such intensive outcrossing and rampant ‘corrective mating’ that it was clear that even the most beautiful and seemingly well suited animal for our program was potentially a genetic landmine. Fortunately, the extreme diversity of the North American llama genome also makes it highly responsive to selective pressure. And as such, while a purebred llama was not to be found, we understood that such a herd could - with much patience and dedication - be resurrected from the rubble. And it is out of sheer awe of this species' potential, and out of reverence for its ancient agrarian birthright, that we begin the work of returning it to its former glory. We invite you to join us.